Sgabei is a fried bread found in the Magra valley of the Lunigiana. Seldom will you see it by itself on the menu, but it may come with an antipasto assortment as is popular in the region (in a restaurant you might simply be asked if you want antipasti and you will get an assortment of plates of appetizers they are making that day, hot and cold). Sgabei is often ordered with a plate of cured meats as you see in the picture. They are hollow, so you can stuff them with your favorite meat. There is also a sweet version that is stuffed with Nutella or other piped-in sweets. Sgabei is a yeast dough made with flour and water with a bit of olive oil, just like you’d use in bread or pizza dough. It’s rolled out into thin strips and cut in a parallelogram shape and fried in oil until it puffs up and is brown. 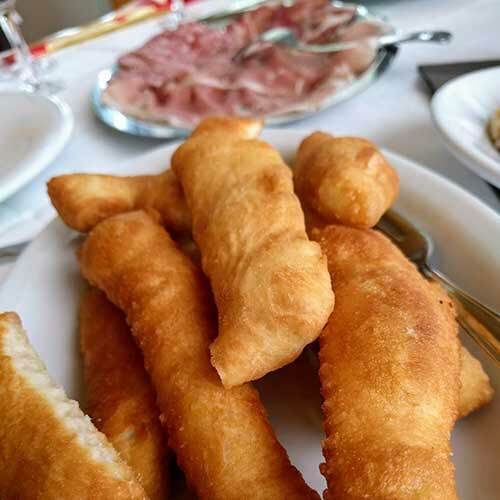 Sgabei often share the name gnocco fritto with a similar fried bread of the Emilia Romagna region, but that version is made with lard and equal parts milk and water. This delicious “fried bread,” typical of Emilia Romagna, is known as gnocco fritto in the provinces of Modena and Reggio Emilia. In Bologna it is called crescentina, in Parma, torta fritta, in the province of Ferrara, pinzino and near Piacenza, chisulén.